If you’d like to see samples of my portrait work up-close, take a tour of Kerrytown Market & Shops. I have displays on the 1st and 2nd floors, and along all three stairways. Many people ask to see samples of the modern gallery-wrapped canvases — these are hung upstairs, across from Everyday Cook. Photos in this collage taken from inside Everyday Cook. View large. While there, pop into Elephant Ears to see the marvelous results of the fashion photo shoot from August. When we arrived to take photos of the displays, we were immediately smitten with some new products on the floor. The aptly named Maxi-Cosi Rodi booster car seat is on our list for Max. And the très swank (and orange!) Quinny stroller design made us wish these were available 5 years ago. 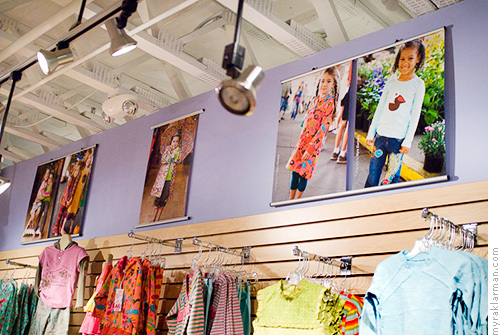 Elephant Ears’ in-store displays feature local kids — perhaps even someone you know! — modeling the latest fashions. Upcoming Kerrytown Event: I’m looking forward to photographing the merrymaking at the Third Annual Tree Lighting Festival in the Kerrytown Courtyard on Sunday, November 25 at 6pm. Sing carols, schmooz with Santa (now there’s a peculiar linguistic juxtaposition), and bask in the glow of the luminary. Last year, about 125–150 people attended. Join us, and be sure to come say hi to me! Many thanks to Karen Farmer, Manager of Kerrytown Market & Shops, for inviting me to show my work at the market, and for including me (and my camera) in the Tree Lighting Festival.